This is from MAGGIE HALL, who was posted to the Daily Mirror’s New York bureau in 1980, and freelanced out of Washington DC from 1983 “but I make frequent visits home”. She hopes her Corfu pilgrimage to find ALAN LAW’S grave – “It was unexpected but it delighted me” – will have a similar affect on all of Alan’s old mates. 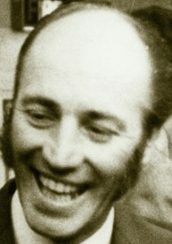 Until his death last Autumn, I had no clue ALAN LAW – whom I counted as a good pal during my London-Mirror days – was living in Corfu. I spent time on the island recently, and as I was getting ready to go I thought: darn, too late to catch-up with Alan. Like many visitors to Corfu, the British Cemetery was on my list of “things to do”. When I went I asked if people were still buried here. Yes, they were. Was there a list of recent burials? No, there wasn’t. Anyway how would Alan be buried here? As the cemetery is under the care and administration of the Commonwealth War Graves Commission, surely it’s the final resting place for war-heroes, dignitaries, VIPs etc. Not that Alan wasn’t that to us, we Mirror old-timers. It was a beautiful, sunny day. It was an emotional and stirring experience wandering around what felt like a secret-garden full of trees, shrubs and burial spots, laid out in a serenely casual way. The cemetery dates back to 1814 (when the British occupied the island) and shows off all types of monumental masonry – some graves adorned with mausoleum-like edifices, others with ornamental markers, many with simple headstones. I’d pretty much made my way all the way round – taking in so much, including the memorial site for the 44 sailors killed in 1946, when HMS Saumarez and HMS Volage hit a mine in the Corfu Strait – and I turned to leave. But as I did I changed my mind and said to myself: hang on, just a few more minutes in that sunny corner, you haven’t been there. So I took a few more steps into the cemetery, by this time pretty much overcome at absorbing the fascinating history of the British in Corfu… and there it was! A gleaming, black granite headstone emblazoned with Alan’s name. Now I was really overcome. 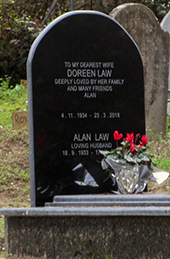 Alan shares his grave with that of his wife, Doreen, who died just six months earlier.